Every January, as we look ahead to our professional growth over the coming year, we remind our staff of one of our favorite perks: fully-funded conference attendance. Viget proudly covers the cost for all our staff to attend at least one major conference every year, and we also proactively encourage our staff to speak at events. These are ways for us to learn new skills, connect with colleagues across our industry, give back to our professional communities, and return to our daily rhythms with new ideas and fresh perspectives. And, inevitably, we note: so many conferences, so little time! So here’s our handy list of 15 for 2015, in roughly chronological order (though some dates are still TBD). Our list is by no means exhaustive, and you’ll see that we carried over some favorites from last year’s list. We hope to inspire you to register for one of the great events below or to seek out others. Have we missed any? Let us know in the comments below. And make it a great year! 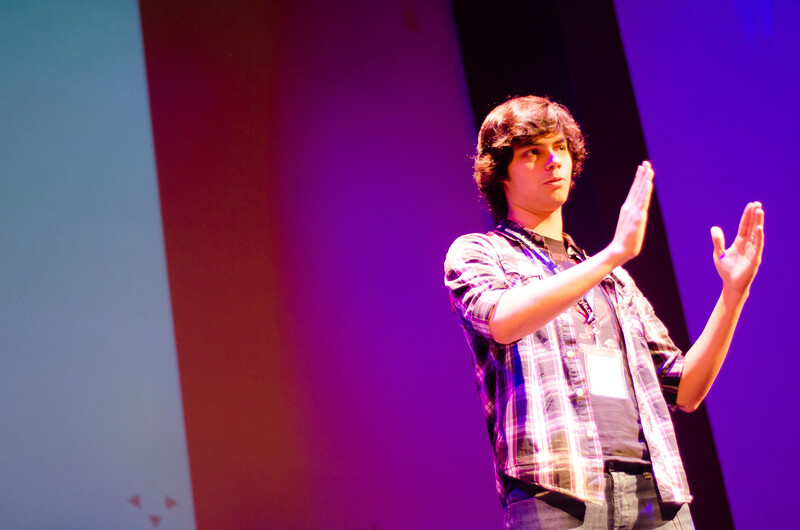 Viget Senior Front-End Developer, Dan Tello, speaking at GiantConf in 2014. (1) Ruby On Ales—March 5-6 in Bend, Oregon. Great talks, great people, craft beers—this is a two-day, single track conference that feels “a lot like a reunion of friends and colleagues.” A nice change of pace and vibe compared to the larger events for programmers. (4) SXSW—March 13-17 in Austin, TX. Don’t let the price, or the hype, stop you on this one. If you haven’t been yet, then go. And if you’ve already been, then go again. If you need more convincing, you can read our recap series here. (5) RailsConf 2015—April 21-23 in Atlanta, GA. We noted last year that this is the largest Ruby on Rails event in the world. It is still the largest Ruby on Rails event in the world. (6) IA Summit—April 22-26 in Minneapolis, MN. Celebrating its sixteenth year, this is a leading conference for anyone who designs and structures information on the web. In past years, our UXers have returned with valuable takeaways, and we plan to be back in 2015. (8) GiantConf—June 14-17 in Charleston, SC. An all-around great conference for anyone in our industry, and especially designers and UXers. Our own Dan Tello (pictured above) was among last year’s top-notch speaker lineup and he/we will be back. (9) Open Source Convention—July 20-24 in Portland. Our teams are interested in all things open source—from new projects/products/languages to best practices to reconnecting with the wider open source community—so, naturally, OSCON has made our list. (10) Circles—September 10-11 in Grapevine, TX. Our team has attended for the past two years and we’re big fans. Despite the deliberately aspirational vibe, there’s definitely some pragmatism too, and we’re planning to return yet again for both. (11) eMetrics Summit—September 27 - October 1 in Boston (although there are multiple dates/locations). We’ve had this event on our radar for a while because it’s a leading conference dedicated to digital analytics and marketing optimization. It’s comprehensive, focusing on both strategy and practice. (12) Google Analytics Summit—dates/location are TBD (most likely late spring/early summer in Mountain View, CA.) As a GA Partner, we attend every year in order to learn the latest on new GA features/tools directly from their creators. (13) BlendConf—2015 dates/location TBD, but it’s usually in September. Viget’s own Mindy Wagner and Jason Toth were among the 60+ speakers in 2013 and 2014, respectively. This is a great generalist conference known for its wide offerings, including hands-on workshops, and its focused, supportive environment (including a “no gadgets rule”). (14) Digital PM Summit—dates/location TBD. Since launching this event in 2013, our friends at Happy Cog/Bureau of Digital Affairs have built it into the leading conference for project managers. Our team had tons of fun attending last fall, and we were proud to see our own Josh Korr and Becky Tornes among its speakers. Eager to see what’s in store for PMs in 2015! (15) Story—dates/location TBD. Providing an inspiring environment for creative practitioners, Story attracts designers, writers, and other creatives nationwide. Our Copywriter, Ally Fouts, returned from last year’s event with new insights into story-telling, experimentation, the value of failure, and some pretty rad scribbles (pictured below). We expect to be back. Viget Copywriter Ally Fouts' scribbles, scribbled at and inspired by StoryConf 2014.